Now that you’ve studied kinematics, you should have a pretty good understanding that objects in motion have kinetic energy, which is the ability of a moving object to move another object. To change an object’s motion, and therefore its kinetic energy, the object must undergo a change in velocity, which is called an acceleration. So then, what causes an acceleration? To answer that question, you must study forces and their application. Dynamics, or the study of forces, was very simply and effectively described by Sir Isaac Newton in 1686 in his masterpiece Principia Mathematica Philosophiae Naturalis. 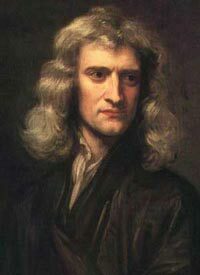 Newton described the relationship between forces and motion using three basic principles. Known as Newton’s Laws of Motion, these concepts are still used today in applications ranging from sports science to aeronautical engineering. Define mass and inertia and explain the meaning of Newton’s 1st Law. Define a force and distinguish between contact forces and field forces. Draw and label a free body diagram showing all forces acting on an object. Determine the resultant of two or more vectors graphically and algebraically. Draw scaled force diagram using a ruler and protractor. Use vector diagrams to analyze mechanical systems (equilibrium and nonequilibrium). Verify Newton’s Second Law for linear motion. Describe how mass and weight are related. Apply Newton’s 3rd Law to determine unknown forces. Define friction and distinguish between static and kinetic friction. Determine the coefficient of friction for two surfaces. Calculate parallel and perpendicular components of an object’s weight to solve ramp problems. Analyze and solve basic Atwood Machine problems using Newton’s 2nd Law of Motion.